angle vise craftsman vs wilton vs palmgrenMINDLESS BORING:angle vise for drill press or light milling. This cradle type angle vise is a quality tool from craftsman that lives up to it's name. In a market flooded with higher priced vises, and questionable over seas quality this angle vise does not disappoint. This 3" angle vise can be compared to brand name vises like wilton and palmgren on the sears sales page at less than half the price. This craftsman angle vise has a dovetail cradle and locking pin for setting angles and a jack screw for added rigidity. Any angle from zero to 90 degrees can be set using the vise mounted protractor. In this video I will show you my collection of milling and drilling vises, compare the quality, and show you what to look for in a quality vise. 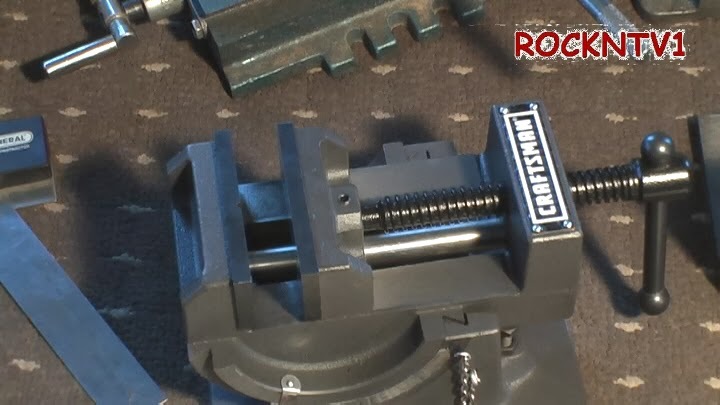 The large movable jaw locating dowel is rock solid when compared to the x-y cross slide vise I purchased, to cobble into a home built vertical milling slide for my lathe. Now that i have a milling machine, The fact that tooling is a necessity is sorely evident, a quality vise can be very expensive, but with out it, it is a drill with out a bit.